Are you a veteran? 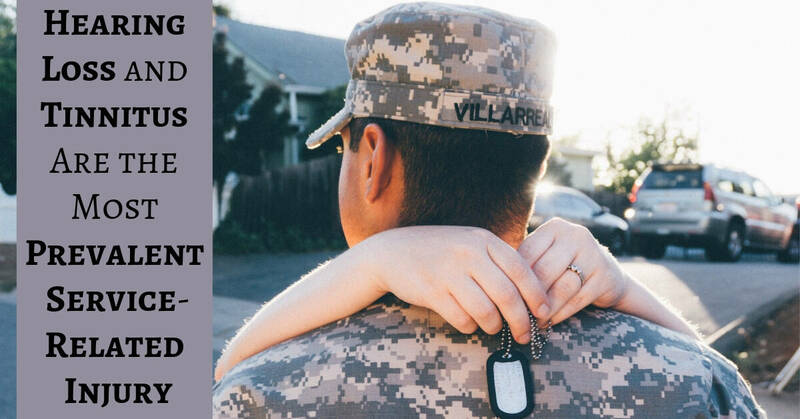 Do you have a loved one who’s served our country and protected our rights and freedoms? A recently released official summary from the Department of Veterans Affairs lists hearing loss and tinnitus as the most prevalent service-related injuries. In fact, over 2 million veterans are struggling to hear. A 2017 report by the Department of Veterans Affairs found that 1,157,585 veterans struggle with hearing loss, and an additional 1,786,980 veterans are living with tinnitus. Veterans are exposed to some of the loudest sounds in the world, including gunshots, emergency sirens, loud equipment and machinery, jet engines, artillery, and explosions. Hearing loss affects every aspect of life. It interferes with clear communication, leading to misunderstandings and fights, and can drive a wedge between loved ones. Living with hearing loss often leads to social isolation, as the person with hearing loss is embarrassed to ask friends to repeat themselves, or is worried they might mishear something and answer a question inappropriately. Tinnitus affects your ability to get a good night’s sleep, focus on tasks, or enjoy a quiet night in with your loved ones. You’ll be more irritable, and this constant ringing or buzzing sound in your ears can drive you crazy. Noise induced hearing loss is completely preventable, which is why these numbers are shockingly high. While military personnel are often aware of the dangers to their hearing, and try to wear hearing protection as much as possible, they’re not always equipped with the right hearing protection, or aren’t wearing the protection correctly. Not only that, but sometimes these loud noises can occur suddenly and unexpectedly, so military personnel work in conditions that are extremely hazardous to their hearing health. There have been a few recent scandals involving providers of hearing protection, and when purchasing safety equipment in bulk, the quality of the equipment isn’t always assured. For example, in 2016 a case came to court, claiming that the manufacturer of the Combat Arms Earplugs Version 2 sold earplugs that weren’t providing appropriate hearing protection to troops using the earplugs. The biggest problem with these earplugs is that they were actually too short to be properly inserted into the ear, so while the military personnel using the earplugs thought they were doing the right thing for their hearing, they were actually wearing ineffective protection, compromising their hearing health, and sustaining massive damage to the delicate cells in their inner ears. As more and more veterans are realizing that their hearing protection isn’t protecting their ears, they’re coming forward and filing litigations against the government, demanding that they be compensated for these injuries, and that the military makes sure they provide appropriate protection for all personnel. One veteran who came forward, Army Sgt. Scott Rowe from Texas, is seeking damages and restitution for hearing loss he sustained on the front lines in Iraq. He’s living with hearing loss and tinnitus after relying on government issued hearing protection, and he also struggles with vertigo and balance issues. This is a common story among the millions of veterans who have hearing loss. At My Hearing Centers, we’re dedicated to supporting our veterans and will work with you to find solutions to your hearing loss or tinnitus. Call us today to book an appointment for a comprehensive hearing test, and together we’ll discover your unique hearing loss and hearing needs. Tell us more about your lifestyle, and what sounds you’re missing out on. Do you spend a lot of time at home with the family, playing with the kids in the park, or enjoy a night out with friends? Whatever your hearing needs, we’ll find the perfect device to give you back your ability to hear, and to easily interact with the world around you. Is tinnitus keeping you up at night, or interfering with your day to day life? Ask about devices with tinnitus therapy programs that will make your tinnitus fade into the background. You’ll be able to enjoy your day without tinnitus, and get a good night’s sleep every night. Visit us today at My Hearing Centers and start your journey to clear hearing. We’ll find the perfect device to help you hear, whatever your hearing loss and hearing needs.